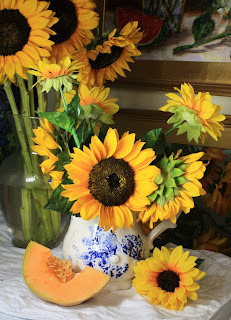 Sweet Cantaloupe and Sunflowers caused quite a stir with the four-footed studio assistants. Little noses were pointed upward, and eyes were searching the heavens for morsels that - if only an earthquake or some other wonderful event would happen - could fall to the ground and land in little mouths. Even the hubby had to be forewarned that at least a portion of the sweet fruit on the kitchen counter must not be consumed, and must be reserved for the easel. Now that the painting is done, however, the cantaloupe will have to face its own demise, doled out to little mouths that have been eagerly waiting all evening, and then the rest chopped and packaged tightly in tupperware for a lunchtime treat at work tomorrow. Rarely is there a time when fruit props in the studio do not instill high drama. I'm sure the same is true for you, if you have four-footed helpers nearby. You are amazing, Nancy! I don't see how you get so many paintings done, especially in oils! Do you work around the clock? Do you use something to speed drying time? Not to mention those adorable pugs just waiting for a tidbit of cantaloupe! Your new painting is beautiful. 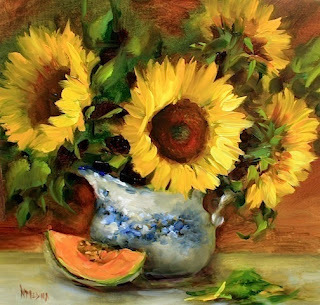 A gorgeous painting that just sings of summer! Lucky studio assistants! i am just getting caught up on blog posts! thank you so much for always sharing it with us!